The Symphony of Lights sound and light show is the largest permanent light show in the world and is one of the ‘must sees’ for visitors to Hong Kong. 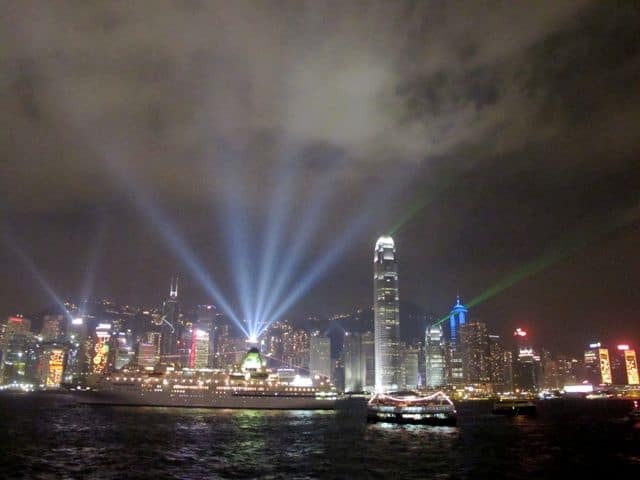 Held every night at 8pm, the best place to view the show is from the Tsim Sha Tsui waterfront on Kowloon. If you’re staying on Hong Kong island, hop on the Star Ferry to Tsim Sha Tsui and walk a few minutes to the viewing deck for the show. The viewing deck along the promenade offers an unparalleled vista of the spectacular skyline of Hong Kong. During the fifteen-minute show, many of Hong Kong’s stunning skyscrapers are bathed in a blaze of colourful lights while laser beams shoot across the harbour; all beautifully synchronised to the music. I wonder if they take requests for the music that’s played. Something dramatic would be cool – it’ll certainly complement Hong Kong’s dramatic skyline! A piece from Tosca perhaps? The Symphony of Lights in Hong Kong. Pretty cool!~! Nice video u find. It’s a very cool show. Things like that at the end of the day, when you want to relax and enjoy your time, is the best thing to watch. I particularly like the musical part of it.